Why Use LienItNow for New York Lien Documents? If you live or work in New York, you know that it's busy, loud and complicated. New York's notice and lien process isn't any different, and since it can be hard to navigate you need someone who can expedite your lien filings. When you have a lot of other things to get done on a construction project, you don't want to be spending time and money figuring out how to file a mechanics lien. LienItNow.com provides the construction industry online mechanics lien forms to help contractors, sub-contractors, and material suppliers obtain a security interest in the property owner's land, and secure the payment they've worked for. In three simple steps, anyone doing construction work in New York can complete a prelien notice or lien in only 10 quick minutes. Once a time-consuming process for New York construction companies, LienItNow.com makes filing your lien claims faster and easier than ever. LienItNow.com can also help you create bond claims, prelien notices and lien releases. LienItNow's services and products are not a substitute for the advice of an attorney. While our site is based on lower cost through the power of "do it yourself", if you need help specific to your issue, you can take a look at our Attorneys Connections page to find a lawyer who can provide the assist. What is a New York mechanics' lien? In New York, liens filed on private property or on funds relating to a public project are known as Mechanic's Liens. A mechanics lien in NY is an instrument created by state statute. These statutes, known as the New York Lien Law, provide specific and detailed instructions on who can file a mechanics lien, when a mechanics lien must filed, and the process by which a mechanics lien is file and served. The New York State (NYS) mechanics lien law allows for three different types of lien: New York private mechanics liens, which are filed on commercial or private projects, New York residential mechanics liens, which are filed on certain residential homes, and New York public mechanics liens, which are filed on government projects. Each of these types of mechanics liens serve a different purpose and effect, but also have different requirements and time periods for filing. When a mechanics lien in New York is filed with regard to work performed on privately owned property, including both commercial and residential property, it attaches to and encumbers the fee simple ownership of property, which means that encumbers the property, similar to how a mortgage affects property. When a New York mechanics lien is filed with regard to work performed on a publicly or government owned property, it attaches to the fund of money which the public agency has allocated for a project. The reason for this is that you cannot force the sale of publicly owned land (public agencies mean any county, city, town, township, public commission, public board or other municipality authorized by law to make contracts for the making of any public improvement in any city, town, township or other municipality). Who can file a New York mechanics lien? The mechanics lien for New York is available to a broad base of claimants. 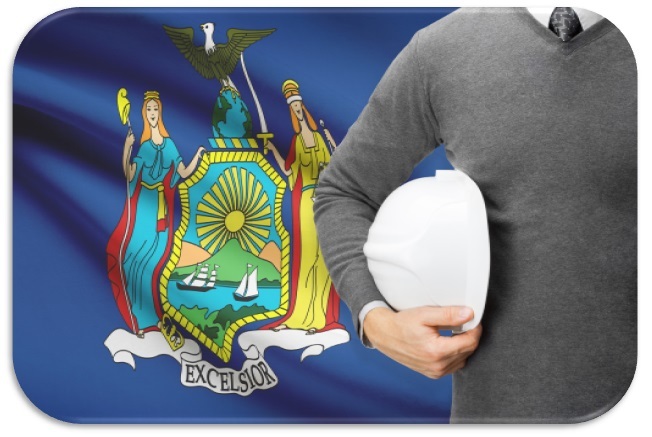 One of the most inclusive laws in the nation, NY mechanics liens can be used by contractors, architects, engineers, consultants, as well as subcontractors, sub-subcontractors and suppliers who have a contract with a general contractor or a subcontractor. By allowing nearly anyone who works on a project to avail themselves of the NY lien law statutes and file a NY mechanics lien, maximum protection is provided to those who provide labor and materials to a construction project in New York. The ability to file a mechanics in lien New York is not limited by the type of project on which one is working: all types of projects, be they residential, commercial or public projects, are subject to lien claims. Are pre-notices required in order to file a New York mechanics lien? It is strongly recommended that preliminary notices or pre lien notices be sent at the commencement of the project or prior to filing a lien claim. The importance of the owner knowing who is providing work or materials to the project is difficult to overstate. Mechanics liens are generally filed due to non-payment. Preliminary notices or NY prelien notices help to resolve that issue by providing identifying information to the owner, and with this information the owner can not only inquire specifically as to who has or has not been paid for work performed, but the owner also knows who specifically to contact in the case of a payment dispute. When should a New York mechanics lien be filed? It is extremely important to pay attention to the time periods for filing a mechanics lien in NY. Mechanics' liens in New York on private property must be filed within eight months of the last date the lienor provided materials or services to the Project. New York mechanics' liens with regard to public projects can be filed at any time before the completion and acceptance of a public improvement, but no later than 30 days following completion and acceptance by the state or the public corporation. New York mechanics' liens with regard to residential single family dwellings must be filed within four months after completion of the work. Do I need a written contract in order to file a New York mechanics lien? Oral contracts are sufficient if you have sufficient documentation to show the existence of an agreement or that you performed the work for which you are filing a New York mechanics lien. How does filing a New York mechanics' lien help me get my money? On a private project, the New York mechanics' lien places an encumbrance on the property (similar to a mortgage or note) that makes it difficult to resell or refinance the property without first removing the lien. On a public project, the filing of a New York mechanics lien freezes the fund of money that has been allocated for the public project, thus reducing or sometimes even stopping the flow of payments to the offending contractor until the lienor is paid. When should a New York Discharge of mechanics' lien claim be filed? One of the hardest questions we are asked is about the timing of when a satisfaction or lien should be filed. Though the question seems easy, filing a discharge or release of lien at the wrong time can lead to a loss of lien rights altogether. Keep in mind that once a satisfaction has been filed, there's little chance of turning back and reinstating the original lien. In general, a satisfaction or discharge of lien should only be filed when payment is in hand. In many cases, the lien release document is exchanged at the time a certified check or wire transfer is made. If an attorney is involved, they will often hold the satisfaction of lien in escrow until the payment clears. In general, however, once the lienor has been paid the amount contained in its lien claim, or has come to an agreement that requires the lien claim to be removed from the property records, a Discharge of mechanics' lien Claim should be filed. Can I file a Bond Claim on a New York Project? In New York, bonds are required on nearly every government owned or financed project. So in New York, in addition to lien rights, contractors on public construction projects also have rights against the project's payment bond. Many private projects in New York also require payment bonds. Note taht bond claims can only be filed on a construction project where the owner, contractor or subcontractor has obtained a payment bond to ensure that every contractor receives payment for the work performed on the Project. The payment bonds issued by sureties for construction projects have specific timing requirements, but most require claimants to submit claims against the bond within sixty to ninety days from the claimants' last date of work. Bond claims are as or more effective than a lien claim because the payment bond acts as a guarantee that payment will be made for work properly completed. Do I need to file a Pre-Notice to make a claim against a New York payment bond? Depending on the terms of the payment bond, in New York, pre-notices on bonds may or may not be required. LienItNow.com recommends that, prior to or immediately after starting work or delivering materials to a project, subcontractors and suppliers, file a pre-notice that it is a potential beneficiary of the construction project's bond. What is a New York Amendment to a mechanics' lien Claim? New York is one of the states that permits the filing of amendments to mechanics' lien Claims. Amendments to a mechanics' lien claim are often needed when something about the claim changes. Common changes to a lien claim are increases or reductions in the amount due to the lienor, or a change to the last date of work. Not all changes require an amendment to the lien claim; and in some cases, a whole new lien would have to be filed, rather than an amendment (such as listing the wrong property in the original lien). Does New York allow liens to be extended? Yes! New York is one of the few states that allows the extension of a lien claim, and that extension can be for one year at a time, for up to two years. Filing an extension of the mechanics' lien claim permits the claimant to keeps its lien for an extra year before it is required to foreclose on the property, except for lien claims to be filed on residential property which cannot be extended.